Last night I had dinner with my friend Craig. Craig also happens to be my very first boyfriend. 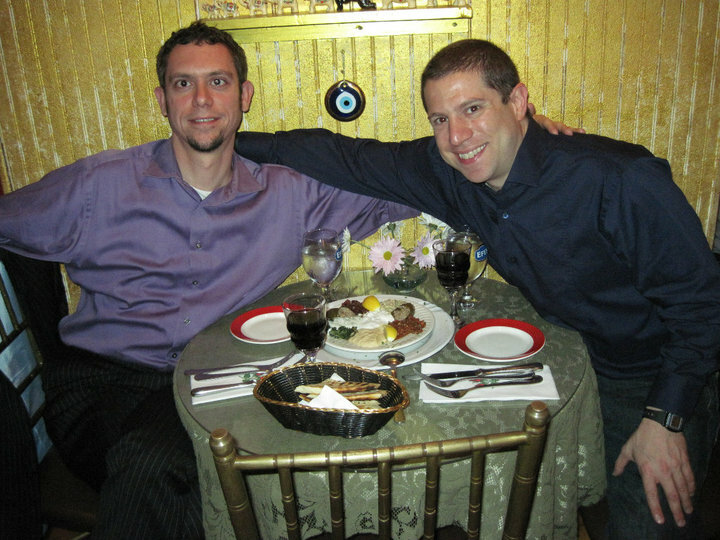 We first met at a social gathering for LGBT youth on Long Island 15 years ago. Neither of us were really out and were still wrestling with what it meant to be gay. Through each other, we also discovered what it meant to be in love with someone. Craig and I dated for about three years, and we stopped seeing each other we worked very very hard to maintain our friendship … which wasn’t easy. But we’re both glad we did and I’m sure I speak for both of us when I say that we wouldn’t have it any other way. This is a picture of us at my FAVOURITE Turkish Restaurant, called “Turkish Cuisine.” It’s a little mom and pop restaurant that serves THE BEST Turkish Food. YUM – YUM – YUM!!! Whats up very nice website!! Man .. Excellent .. Superb .. I’ll bookmark your site and take the feeds also…I am glad to search out so many useful info here in the publish, we’d like work out more techniques on this regard, thanks for sharing. . . . . .
highly useful and skillfully written. Great Work.